Maintaining proper calcium and alkalinity levels is crucial in a reef tank because these are the major elements corals need to grow. Using kalkwasser is a great way to maintain these levels. In aquariums with lower calcium demands, kalkwasser is often sufficient to be the only source of calcium supplementation. In aquariums with higher calcium demands, it is a great complement to other methods such as a liquid 2-part solution or a calcium reactor. 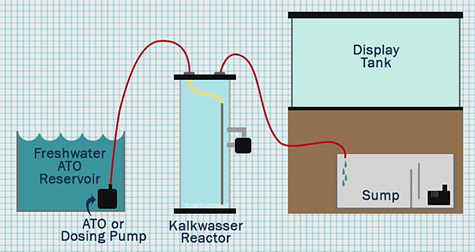 Today we are going to discuss kalkwasser reactors, show you how they work, explain why you need one and provide you with some helpful tips for getting a reactor installed on your tank. Not only does kalkwasser add calcium and alkalinity to your aquarium, it also has several other very desirable benefits. Dosing kalkwasser will help to raise and maintain a proper pH level. Low pH tends to be a common issue among hobbyists and saturated kalkwasser solution has a pH of 12.4 so it is very effective in raising the aquarium pH. It is also widely known that using kalkwasser will help reduce phosphate levels via precipitation which in turn helps to keep nuisance algae at bay. The one drawback of kalkwasser is simply the work required to dose it properly. You need to dose Kalkwasser at the proper concentration and it must be dosed slowly to avoid dangerous swings in pH. The cheapest way to dose kalkwasser is via gravity drip or through your auto top-off (ATO), but this approach requires frequent mixing of new kalkwasser solution to ensure the concentration is correct. Since the quality of the kalkwasser mixture begins to degrade as soon it is mixed and exposed to air, mixing kalk in an unsealed container that is not constantly agitated will require frequent replenishment. This is where a kalkwasser reactor can help and will solve the problem of having to frequently mix new solution and ensure perfectly saturated kalkwasser solution is dosed into your tank each and every time. A kalkwasser reactor (also known as a kalk-stirrer) is a very helpful tool that will save you a lot of time and maximize the effectiveness of dosing kalkwasser. A kalkwasser reactor is an inline, sealed chamber that works with your ATO or a dosing pump to dose kalkwasser solution into your tank. Kalkwasser is first added to the reactor chamber. Then the chamber is filled with freshwater and connected inline between your ATO pump and your aquarium. The sealed chamber is mixed several times throughout the day to keep the solution saturated. With most reactors, a simple home appliance timer or aquarium controller will be attached to the pump or motor on the reactor to activate the stirring a few times each day. When water is needed to top off your aquarium, your ATO or dosing pump will be activated and pump freshwater into the kalkwasser reactor and the saturated solution inside the reactor will be pushed into your aquarium. This will then supplement your tank with kalkwasser solution and replenish freshwater at the same time. 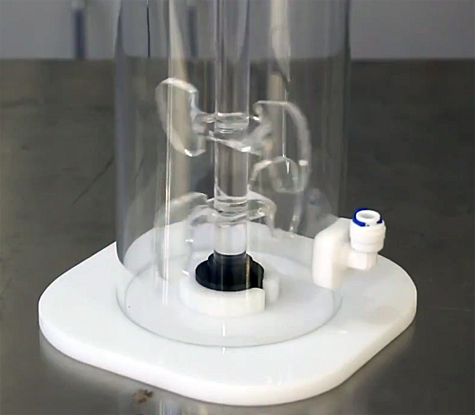 Because a kalkwasser reactor chamber is not exposed to air and is mixed regularly, you are able to maintain a super-saturated solution—getting the most out of your kalkwasser. In most situations, you will only need to add new kalkwasser every couple of weeks. We carry four brands of kalkwasser reactors here at Marine Depot: Bubble Magus, Precision Marine, Reef Octopus and Two Little Fishies. 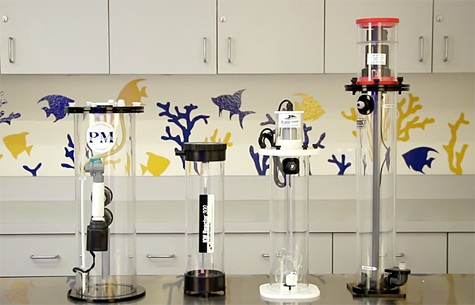 Both Bubble Magus and Reef Octopus utilize motorized stirrers to keep the kalkwasser solution saturated. 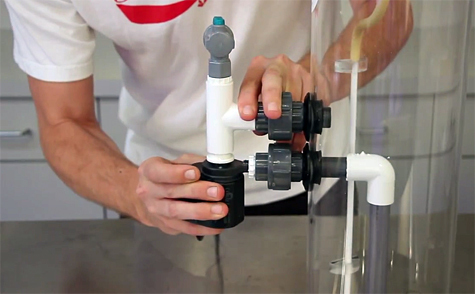 The Two Little Fishies reactor utilizes water pressure from your ATO pump and a special valve to mix the kalkwasser solution inside the reactor. This is pretty cool because it does not have any electronic parts and does not require a timer or controller. While the TLF is one of the most economical reactors on the market, it does have more specific ATO pump requirements and will require more frequent cleaning. The Precision Marine KR620 is the most popular kalk reactor among our customers. We love the fact that it is made in Texas and built like a tank! The Cobalt Aquatics MJ pump used for stirring is very dependable and durable. Should the pump ever fail or get worn out, it is very inexpensive and easy to replace. Precision Marine is known for making robust, high quality aquarium equipment and the KR620 is a prime example of PM craftsmanship. If you are looking for an effective way to automate calcium and alkalinity supplementation for your reef aquarium, we are happy to help you get the products you need for a smooth installation. Don’t forget to like, share and subscribe to show your support if you found this information helpful so we can continue to provide you with more awesome aquarium tutorials. Until next time… take care and happy reef keeping. 4Shop for Kalkwasser Reactors in our online store. 4Read customer reviews about Kalkwasser. 4Learn How to Dose Kalkwasser in this blog post and video. READ Do you love aquariums and making customers happy? We are hiring 2 new support team members! 4Read 10 Frequently Asked Questions Kalkwasser on this blog.